As a fitting corollary to our previous post, we encourage you to read this article on Police Use of Force written by legendary NYPD whistle-blower, Frank Serpico. Serpico exposed the graft within the NYPD during the early 1970s and nearly paid for it with his life after being set up by police on a fake narcotics raid. The award winning movie “Serpico” depicts his life. Oscar winner, Al Pacino, played his character. In this article, Serpico highlights the greatest threat to the reputation of the police today. He expresses that the issue of “use of force” has surpassed that of corruption among some police forces. via The Police Are Still Out of Control – Frank Serpico – POLITICO Magazine. On 30th October, 2014 the College of Science, Technology and Applied Arts of Trinidad and Tobago (COSTAATT) staged the final of its 2014 public seminars. The seminar focused on the thorny issue of “use of force” by persons in the Police and Prisons Services of Trinidad and Tobago. The seminar was hosted by COSTAATT’s Department of Criminal Justice and Legal Studies which is the successor body to the Joint Services Staff College (JSSC). The JSSC was established in 1978 and tasked with ensuring that members of the protective services and Defence Force had the necessary professional and technical competencies to manage the agencies which fell under their purview. Organised by Department Chair, Kirwin Pyle-Williams and moderated by lecturer, Wayne De Landro the seminar took the form of a 6-member panel discussion addressing various aspects of the use of force by police officers, prisons officers and the impact such incidents had on the community, with particular focus on the “crime hotspot” communities of Sea Lots and Laventille. Panellists included Acting Inspector Espinoza of the Police Service who sits on the Use of Force Committee; Ms. Margaret Sampson-Browne of the Victim and Witness Support Unit; Retired Superintendent of Prisons Martin; CURB President and Attorney-at-Law Adrian Alexander; Criminologist Renee Cummings and Community Activist Hal Greaves. The presentations were thoroughly researched, professionally delivered and well received by the audience which comprised mainly students of the Department of Criminal Justice and Legal Studies from the various COSTAATT campuses. 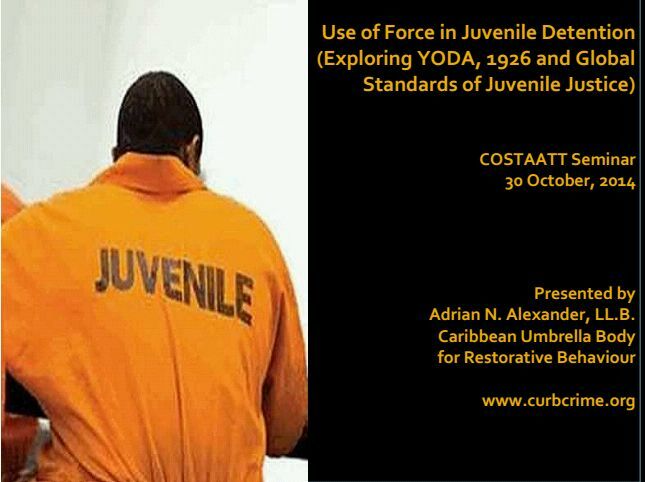 CURB’s Adrian Alexander was asked to address the issue of Use of Force in Juvenile Detention facilities and was able to outline to the audience the provisions of the Prisons Rules and the Young Offenders Detention Act and Regulations which cover disciplinary offences and punishments for young male offenders at the Youth Training Centre. He compared these provisions with subsequent international instruments such as the UN Convention on the Rights of the Child, the 1990 UN Havana Rules for treating with Juveniles Deprived of their Liberty and the 2008 European Union Guidelines of a similar nature. In plotting a way forward to bring the Young Offenders Detention Act into the 21st century, Mr. Alexander urged for a phased approach. He advocated for the recruitment and training of officers specifically in youth development, equipping such officers with skill sets to enable them to facilitate restorative justice initiatives to address disciplinary offences which may arise at the institution, and allowing the officers time to master those skill sets by having a parallel system of restorative justice alongside the current punishment structure before phasing out the latter. During the Question and Answer segment, Mr Alexander was asked why he thinks the restorative justice philosophy had not taken root with the public in Trinidad and Tobago to a great extent. He replied that the recent Restorative Justice Conference revealed the degree to which there had been a grave misunderstanding of the meaning of key terminology wherein restorative initiatives were mislabelled as restorative justice initiatives. He highlighted that true restorative justice is victim centred and the public would be more responsive to that as a selling point than the past strategies of touting restorative justice principally as a means to reduce crime and re-offending. The issue of prisoner abuse in Trinidad and Tobago took a new turn recently. While an historic National Restorative Conference was taking place in Port of Spain, a High Court Judge was adjudicating the award of damages for 2 inmates who had sued the State for injuries sustained during a beating received from prisons officers. “Justice Frank Seepersad, in delivering a ruling at the Hall of Justice in Port of Spain yesterday in favour of two prisoners who were beaten by officers, said taxpayers were being over-burdened by their money being used to pay such costs”. He opined that prisons officers may not engage in such use of unreasonable force against inmates if they knew that they would be required to pay part or all of the Court’s award of damages. Seepersad said the time had come for the State to stop “abdicating its responsibilities” and implement prison reform, pointing out there was an urgent need to train and equip officers who, on a daily basis, were required to deal with difficult conditions and operate under “psychological warfare” as they carried out their duties. He said despite there being talks concerning the abuse of prisoners, there were still inadequacies relating to the implementation of systems to deal with the issue. The judge said proper training of officers might ensure they did not overstep their boundaries when faced with situations where they were met with resistance by inmates, but would instead employ other methods apart from that of unreasonable force. He added that despite being convicted, prisoners still had their constitutional human rights, saying there was a need for a review of prison rules and even though draft rules were in circulation, the system was still operating under archaic ones. “The urgent implementation of new systems must be done as a matter of urgency,” he said. In view of the intention of the Ministry of Justice to proceed with the development of a national restorative justice policy, it would be interesting for them to take the initiative to have restorative conferences or circles around these issues. Such interventions would bring together inmates, officers, their respective supporters and key community stakeholders discuss the issues of prisoner abuse and arrive at solutions to repair the harm caused, address causal factors of the officers’ behaviour and develop possible policy and operations changes to reduce the likelihood of future inmate abuses through use of unreasonable force. While the learned judge may well be correct in his recommendations, we believe that having the Prisons Service and the particular officers participate actively in a discussion of the issues and agree with other stakeholders (including key officials of the Ministry of Justice) as to the way forward would bring genuine change to the prisons for the benefit of officers, inmates, the State and taxpayers alike. For more on this news item, please see the Trinidad Express article here. Noted psychiatrist and president of the Psychiatrists Association, Dr. Varma Deyalsingh, reportedly commented on the impact of prison conditions on the mental health of incarcerated persons. He has made some valuable suggestions for the treatment of the issues which go beyond the current recommendations from other quarters for the installation of CCTV cameras in prisons. Dr. Deyalsingh intimated that prisons authorities need to implement measures of assessment (of prisoners and their prior mental health issues) as soon as possible and deal with prison conditions as well such as allow prison authorities to work closely with the police and the judicial system to ensure that cases are expedited and that prisoners have their matters dealt with in the shortest possible time. CURB hopes that the prison authorities work closely with the civilian arm of the prisons, the Council of Prison Chaplains and Ministers (COPCAM), to develop effective means whereby assessment and monitoring of potentially suicidal inmates can occur. We believe that the members of COPCAM can support the work being done by the trained psychologists and other mental health professionals in the prison system, even as budgetary allocations are made for a greater number of permanent mental health staff for the thousands of prisoners and remanded persons in the local prison system. We hope this matter receives the priority it deserves as the Ministry of Justice prepares to host the nation’s first Restorative Justice Conference in October, 2014. Preventing, reducing and addressing mental health issues of both victims and offenders is a key component in the process of the restoration to wholeness of persons involved in the criminal justice system. via Deplorable Prison Conditions Can Deteriorate Prisoners’ Mental Health.. The second reported suicide within 2 weeks has allegedly occurred in the prison system in Trinidad and Tobago. Each victim was a male inmate, the first serving a sentence and the other on remand for murder. In each instance, the State failed to fulfil the conditions of the warrant under which it received the individuals and the inmates’ families are left grieving. The first alleged suicide may be linked to unfair treatment the victim may have been receiving at the hands of prison staff. A motive for the latter may be that the victim had become despondent over the slow pace of justice in brining his matter to trial. While many may see this as “just desserts” for persons convicted and accused of violent crimes, CURB maintains that continuous exposure to situations which instil such a sense of despair in people that they contemplate self-harm ought never to be a hallmark of the penal system in this twin island nation. Mental health challenges are a known consequence of incarceration. Anticipation of these collateral outcomes and a thorough risk assessment and action plan to address the same must be a feature of any modern corrections system. Some may consider the continued failure to allocate sufficient resources to address these issues as a dereliction of duty or an example of negligent homicide. A recent determination in Canada after a coroner’s inquest has indicated that corrections officials there were possibly guilty of homicide in the aftermath of the suicide of a female inmate. The decision was accompanied by several recommendations from the civilian panel as to key changes to be made to the system so as to prevent future self-harm incidents. Regrettably, corrections officials have signalled that costly recommendations (though potentially effective to reduce self-harm) may not be implemented. CURB has been speaking to issues of prison abuse and self harm of inmates for the past 7 years. The lack of interest shown by some prison authorities and policy makers is symptomatic of the lack of interest on the part of members of the public as to the abuses and atrocious conditions which exist behind bars. We consider such attitudes to be myopic and proof of the lack of information as to the correlation between in-prison conditions and public safety. CURB maintains that the local and global evidence clearly supports our contention that the continued abuse of incarcerated persons and or their exposure to conditions which fail to meet the UN minimum standards for the treatment of prisoners is a catalyst for re-offending. In the past 10 years, the local re-offending rate has purportedly risen from 56% to over 70%. Just as our hearts are pained for the families of victims of crime, we mourn the loss of these lives entrusted to a failing criminal justice system. It is a travesty of justice for a convicted prisoner for a term of years to not be able to re-enter society upon the expiry of his warrant and a greater travesty for a person accused of an offence to never get his constitutional day in court. We can only hope and pray that the loved ones of these men do not engender a hatred for society and the State to whom they may ascribe blame for the deaths of their incarcerated relatives. We await the outcome of these instances and wonder whether a Canadian-style legal challenge which holds the State and prison officials accountable for self-harm by inmates may not be needed to spark improvements in the operations of our nation’s prisons. via Trinidad and Tobago’s Newsday : newsday.co.tt :. Today CURB was represented among a small group of selected attendees at a seminar on the use of TASERS as a non-lethal tool for law enforcement. After having campaigned for the end of sexual and physical abuse of prison inmates and detainees for several years, we were interested to hear how TASERS could be incorporated into the prison settings to reduce the extent of physical harm occasioned to inmates. The seminar took place at A&E Tactical in Trincity Industrial Estate. In addition to CURB, other invited guests were from WINAD (which has been doing excellent work to address the proliferation of small arms in the country), COSTATT’s criminal justice and law lecture team, Chamber of Commerce and a well-known security firm. We were informed that a similar seminar had been conducted for representatives of the protective services once week before. There were some concerns as to why the police were not using the almost 500 tasers they had purchased over the years. Some persons suggested that there was some doubt as to the legality of the tasers since no specific legislation had been passed authorising their use by police. CURB is aware that non-lethal tools such as tasers have been incorporated in corrections facilities in developed nations as a means of controlling high risk situations involving inmates. From the research presented at the seminar, there have been relatively few cases of deaths or serious injury from the use of tasers as compared with other traditional tools or instruments for the use of force. We await with bated breath to learn how this situation unfolds. Hopefully, the owners at A&E Tactical would make a strong lobby for the use of TASERS in the penal system while they wait to hear the outcome of their efforts for the inclusion of the tools by the police. T&T Prison Abuse cited in US released Human Rights Report 2014. Physical Conditions: The country’s prisons, with a design capacity for 4,886 inmates, held an average daily population of 3,800. Of those, approximately 1,700 were convicted inmates, and 2,100 were in pretrial or other status. Pretrial detainees often waited six to 10 years before their cases went to trial. Some prisons suffered from extreme overcrowding, while others were not at full capacity. Observers often described the Port of Spain Prison and the Golden Grove Remand Yard as having particularly poor conditions and severe overcrowding, with as many as 10 prisoners kept in 10-by-10-foot cells. The Port of Spain Prison, designed to hold 250 inmates, held 600 prisoners, and the Remand Yard, designed to hold 600 inmates, held 1,156 prisoners!!! Neither of these facilities had adequate lighting, ventilation, or sanitation facilities. T&T Prisoner Dead after Alleged Escape Attempt. Yet another inmate has been killed allegedly at the hands of prison authorities in Trinidad and Tobago. This time the deceased was a remandee awaiting trial on a charge of murder. We trust that the legal process will move swiftly and that law enforcement authorities will investigate the matter thoroughly to ensure that justice is done for the family of the deceased. Prisoner dies after alleged escape attempt | Trinidad Express Newspaper | News.